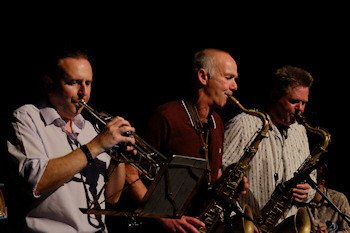 The Alleycats are an Isle of Wight based fusion/funk band known for their interpretations of numbers by Herbie Hancock, Jaco Pastorius, the Crusaders and Michael Brecker amongst many others. The band personnel is interchangeable but is lead by Gary Plumley (saxophones) who is one of leading jazz-funk saxophonists in the UK and performs regularly with Sax Appeal as well as having played with Terry Callier, Snowboy, The James Taylor Quartet, the Four Tops, George Michael, Lisa Stansfield, Swing out Sister, Shakatak and many others. Other regular members of the band are , Jim Thorn (keyboards), Jon Thorne (bass) and Ken Black (drums).